On January 17th, SACC-NE had the pleasure of welcoming Erik Högberg to the Operations team, as the Chamber's Project Management & Strategy Development Intern. Erik joins us directly from Linköping University, where he is pursuing his Master's of Science degree in International Business and Economics. He has plenty of non-profit organizational experience, with a chairmanship at the Linköping district's Swedish Young Shareholders' Association being his latest commitment before leaving Sweden for the U.S. 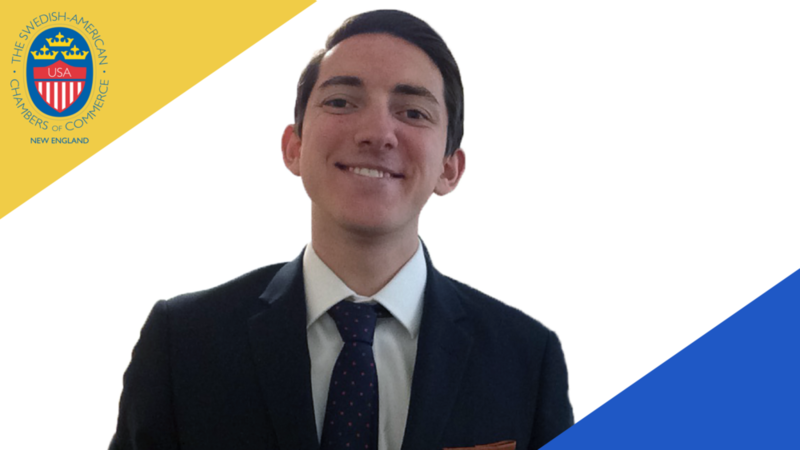 Being of both Swedish and Greek descent, as well as having professional and educational experience from both France and Canada, Erik is passionate about international trade and looks to bring that passion into his work at SACC-NE. What made you want to join SACC-NE? - I am always in a self-improving state of mind and actively search for opportunities to develop and improve myself further. This internship not only exposes me to how different businesses, in both the U.S. and Sweden, function but also provides me with tangible, real-life knowledge and experience from a dynamic market such as Boston. For someone who is constantly curious and wants to learn more about business and international trade, this was truly the perfect fit. If you had to summarize your time at SACC-NE so far in one word, what would it be? - Shangri-La (chuckles). On a more serious note though, it has truly been everything I wished for and I am incredibly excited to continue working alongside the Operations Team, as well as continue interacting with the fantastic community that is the SACC-NE Network. Any advice for newly arrived internationals in the Boston area? - Keeping in mind that Swedes generally like keeping to themselves more than Americans do, I believe it is important to be open-minded and not to get too comfortable in everyday life. The word "yes" should be your best friend as opportunities to connect with new people and experience new things are always around the corner. - Hopefully in an international business setting, getting to work with management and organizational culture/psychology questions. On a personal level, I still see myself rooting for my Carolina Panthers, exploring all the hiking trails that I possibly can and keeping my coffee addiction up and running.